The Porsche 911 GT3 delivers motorsport-like performance, a systematic lightweight construction and an unfiltered driving experience. In the new generation of the radical two-seater, the connection between everyday driving and the racetrack is more intense. At the heart of the enhanced model is a four-litre flat, six-cylinder engine. 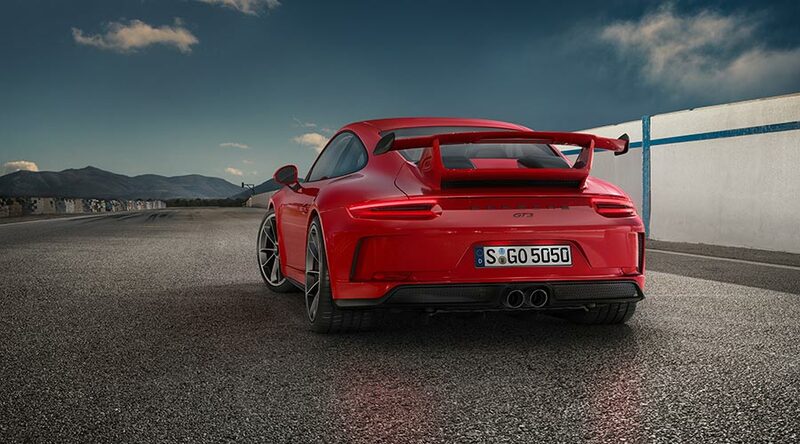 The extremely high-revving naturally aspirated unit with 500 hp (368 kW) remains virtually unchanged from the thoroughbred 911 GT3 Cup racing car. A redesigned chassis with rear-axle steering and the systematic lightweight construction are specifically tuned to convert the engine power into superior driving dynamics. Developed on the same test track and manufactured on the same production line as the racing cars, Porsche’s motorsport technology has once again been incorporated into a road-approved sportscar. 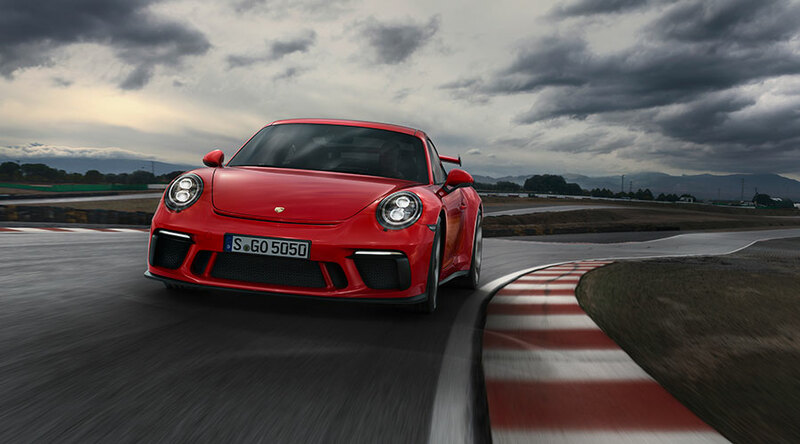 The majority of Porsche GT drivers also like to take their sportscars for a spin on the racetrack, which is where the new 911 GT3 really comes into its own, thanks to a power-to-weight ratio of 2.86 kg/hp (3.88 kg/kW). With seven-speed double-clutch transmission (PDK) as standard, which has been specifically tuned for use in the GT, the two-seater can accelerate from 0 to 100 km/h in 3.4 seconds. It boasts a top speed of 318 km/h and weighs 1,430 kg (with a full tank of fuel). For proponents of pure unadulterated driving, Porsche also offers the 911 GT3 with a six-speed sports manual gearbox. This enables the high-performance 911 to sprint from 0 to 100 km/h in 3.9 seconds and reach a top speed of 320 km/h. The chassis of the new 911 GT3 benefits from Porsche’s motor racing experience which has been reworked for even better driving dynamics. The new two-seater sits around 25 mm lower than the 911 Carrera S. In addition to the further refined basic design, the chassis also boasts superior handling characteristics, thanks in large part to the active rear-axle steering. Depending on the speed, it steers either in the opposite or the same direction as the front wheels, thereby improving the vehicle’s agility and stability. The dynamic engine mounts and the rear differential lock also boost the car’s driving dynamics. Appearance wise, the 911 GT3 leaves little doubt as to its purpose. The dominant carbon rear wing emphasises the sportscar’s aerodynamic form. The lightweight front end and front spoiler have been optimised for an even better airflow. Further aerodynamic enhancements are evident on the lightweight rear end with exhaust air openings and on the new diffusor. The interior of new high-performance sportscar is tailored to the 911 GT3 driving experience. The GT sports steering wheel with a diameter of 360 mm originates from the 918 Spyder. Both the driver and passenger experience the dynamics in Porsche Sports seats Plus featuring enhanced seat side bolsters and mechanical fore/aft adjustment. The seat height and backrests are adjusted electronically. Porsche offers three additional seat variants for the 911 GT3: The adaptive Sports seats Plus boast electrical adjustment of all seat functions (18-way). The second option is sports bucket seats with folding backrest, integrated thorax airbag and manual fore/aft adjustment. The third variant is full bucket seats made from light carbon fibre-reinforced plastic in carbon-weave finish. In addition to Porsche Communication Management (PCM), standard equipment also includes the Connect Plus module and the Track Precision app. The Track Precision app enables 911 GT3 drivers to display, record and analyse detailed driving data on their smartphone. The all new Porsche 911 GT3 is available to order now. It will be launched in India from mid-September, with a basic retail price ex-showroom Maharashtra of INR 21,991,000. Are you interested in new Porsche 911 GT3?